The end of the football season showed us cricket lovers a few things. One is the delight we can all share in the fact that a Joey Barton equivalent doesn't exist in the sport. The other is that, in its purest form, the exhilaration of success and devastation of failure are what makes sport what it is; the greatest entertainment on earth. And it was with the Premier League's Mancunian dichotomy in mind that I chose to reflect on the bore draw between Hampshire and Derbyshire this weekend - probably not my smartest moves. And sure, losing two full days of cricket to rain as we did at the Ageas Bowl last week was never going to be conducive to achieving a result in this match, and so it came to pass with the game petering out into a tepid draw on a sunny Saturday afternoon. During the deluge of rain on day 1, Hampshire announced the signing of former Nottinghamshire batsman Bilal Shafayat on a short-term, pay-as-you-play type arrangement. The response on Twitter was immediate, with pundits acknowledging that the former England under-19 batsman had the talent to succeed at the highest level if he could apply himself. A 164 run partnership on day three with skipper Jimmy Adams would certainly have endeared him to his new employers, although he's been scoring bucket loads of runs in Hampshire's Second XI in recent weeks, so perhaps they weren't entirely surprised? If Shafayat's performance was pleasing to manager Giles White then he must have been absolutely delighted when Captain Jimmy Adams scored 122 on the same day. Adams' highest score before this match this season was 13 and the opener showed guile as well as a classic display of driving en route to three figures. Critics had been rounding on the skipper before this match, making the timing of this innings – coming on the back of a two- match absence – all the sweeter. It spurred his side on to 352-8 on Friday, a decent total although concerns over the way the middle order folded were present again, despite packing the line up with seven specialist batsmen, Sean Terry batting at seven. His form (he managed just 3) will be of concern and with Michael Carberry returning to the side this week against Yorkshire and with Shafayat excelling, Terry will almost certainly make way. 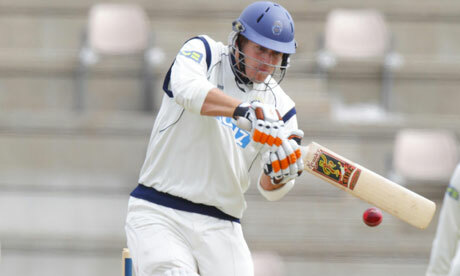 Hants declared overnight having first tried to negotiate a run chase with Derbyshire captain Wayne Madsen for day four. A double second innings forfeiture was discussed by the captains, as was smaller, aggregated total. Neither could be agreed upon and thus a batting procession ensued with Derbyshire on the hunt for batting bonus points. You can hardly blame them. Sitting top of the table and with their closest challengers, Yorkshire, chasing an unlikely 400 for victory in their game with Gloucestershire, Derby didn't need to take any risks. Yorkshire won though, and one would imagine that if Derby miss out on promotion this season, this might be the result that cost them. We shall see. In any event, Hampshire played Kabir Ali and James Tomlinson for the first time this season and both took 3 Derbyshire wickets as the home side tried desperately to take wickets, but with only 3 front line bowlers played - Hamza Riazuddin, James Griffith and Chris Wood all missed out here - bowling the visitors out was always going to be a near on impossible ask. And quite what Hants first choice bowling attack is now is anyone's guess, with Balcombe demoted to first change as Ali and Tommo opened. So for Hants, some good batting practice and another shake up in the bowling department which leaves us, well I don't know where. You would imagine Wood will return this week for Yorkshire, whilst the on-going early season conditions may mean Danny Briggs has to sit on the side-lines for a bit longer. But all in all it was a rather sub-optimal end to this game. There's an acceptance that four day cricket is traditional and many people are content with that, but on days where a result is impossible, frankly, what's the point?